Every glimpse we get of Sedaris's family and acquaintances delivers laughs and insights. He thwarts his North Carolina speech therapist ("for whom the word pen had two syllables") by cleverly avoiding all words with s sounds, which reveal the lisp she sought to correct. His midget guitar teacher, Mister Mancini, is unaware that Sedaris doesn't share his obsession with breasts, and sings "Light My Fire" all wrong--"as if he were a Webelo scout demanding a match." As a remarkably unqualified teacher at the Art Institute of Chicago, Sedaris had his class watch soap operas and assign "guessays" on what would happen in the next day's episode. This is one book I just couldn't put down.Except when it fell out of my hand, because I was laughing so much. Right from the first person narration that makes one feel that they are having a conversation with the author to the ironic sense of humor that David Sedaris possesses, I loved this book. There have been many many bad reviews about this book, but I absolutely loved it! Its witty, tongue in cheek humor will have you giggling throughout. 'Me talk pretty one day' is a set of personal essays written about the authors real life experiences he had during his childhood as well as while he lived in France. This book is my 'cheer up' book. When I'm low and down, I refer to a funny essay and its a road to short, stupid laughter. I literally stopped reading this book in public, as I always embarrassed myself laughing out loud, sometimes falling off where I was sitting attracting awkward stares. Some of the funniest essays are about David Sedaris's experiences while learning french. "I horrify the French every time I open my mouth." Like any new language it can be particularly confusing and he struggled with gender in the language and his french teacher did not help matters much! Another thing David Sedaris does it bring out major satire in the book. In a humorous indirect way he criticizes society and how people look at things in todays era. "Every day we're told that we live in the greatest country on earth. And it's always stated as an undeniable fact: Leos are born between July 23 and August 22, fitted queen-size sheets measure sixty by eighty inches, and America is the greatest country on earth. Having grown up with this in our ears, it's startling to realize that other countries have nationalistic slogans of their own, none of which are "We're number two!"" 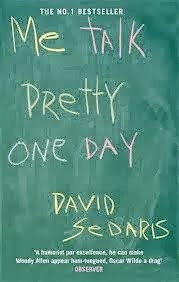 Sedaris has a knack of telling stories, relating incidents that somewhere you can relate to, and thats what makes one enjoy them.His perfect grammar, flawless timing for catch phrases and jokes makes the book brilliant!It is filled with intellectual sarcasm that is not too loud or out there, but evident enough to entertain you! If you're expecting great literature, then this may disappoint you. But if all you're looking for is a good laugh and a complete stress buster, then a book that can be read and re-read! This was a great review. I cant wait to land my hands on this one.